Horsforth Fairweather FC, the Web Site. 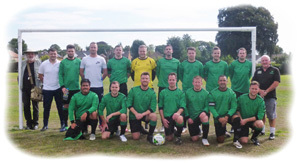 Welcome to the Home Page of Horsforth Fairweather FC, of the Wharfedale Triangle League Premier Division. For further pages, please click on the green links. HFFC 2018-19. For larger picture, click here. HFFC web site by Steve Burns © 1998-2019, all rights reserved.